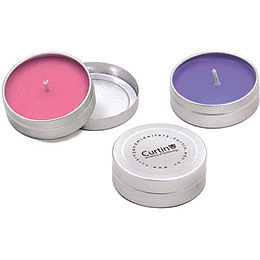 Tealight sized travel candle tins available in a range of aromatic fragrances. Sleek, stylish, relaxing and transportable. The perfect promotional gift for the home or office. GM Free, Natural Soy Candles filled to order. Fragrances/Colours: blueberry (blue), frangipani (yellow), citrus (orange), strawberry (pink), green tea and lemongrass (green), lavender (purple), vanilla (cream).